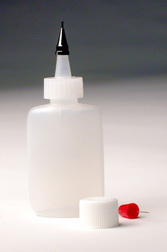 To assemble metal tip to plastic applicator: Remove metal tip and pin from inside the bottle. Cut off the plastic tip half way betweeen the top of the tip and the plastic ridge on the tip. Screw the metal tip onto the plastic tip. 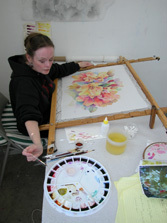 Once the metal tip is firmly in place, refrain from removing it. Many of my students find the larger oval shaped applicator to be a more comfortable and an easier to control alternative to the small round applicators for applying gutta, water based and water soluble resists. Have one available for each type of resist. (Dry clean to remove gutta.) 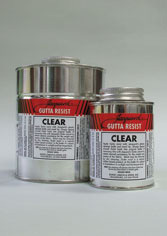 The best resist for painterly effects. It will hold up to dye and alcohol diluent.